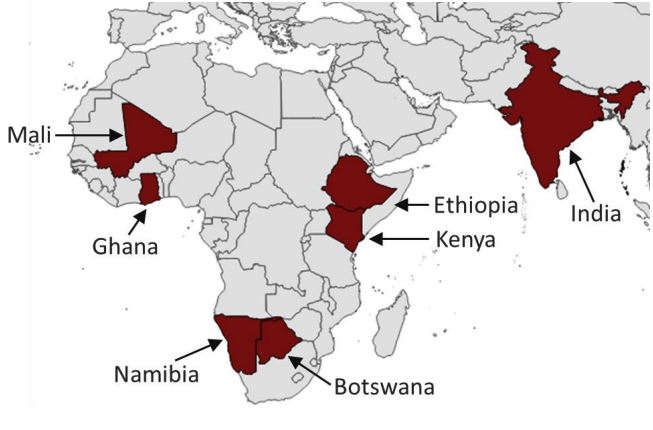 Figure 1 from page 5 of the working paper: Map of all ASSAR study countries. Developing nations are the most vulnerable to the impacts of climate change. This is particularly true for semiarid regions (SAR) – climate change hotspots characterised by limited resources, remoteness, susceptibility to natural disasters, vulnerability to external shocks, and fragile environments. In these hotspots, an increase of just half a degree in global temperatures might have a significant effect, as seemingly-small temperature increments can lead to distinct climatological conditions at the local level. In October 2018, the International Panel on Climate Change (IPCC) released a special report on the impacts of global warming of 1.5°C (IPCC, 2018) above pre-industrial levels – the target set by the Paris Agreement in 2015. To coincide with this IPCC report, ASSAR developed a set of country-specific analyses that examine how projected 1.5°C and higher (half degree increments up to 3°C) global warming could affect temperatures, precipitation, and climate extremes within the semi-arid and arid regions of each of the African countries where ASSAR works, namely: Botswana, Ethiopia, Ghana, Kenya, Mali, and Namibia. We also explore how these local-level climate changes would impact on water, agriculture, health and other vulnerable sectors in these areas. This working paper* describes how the analyses are done. The timing of this work is critical as global temperatures could exceed the 1.5°C threshold by as early as 2026 (Henley and King, 2017). Other estimates indicate that in the absence of considerable emission reductions the world will cross the 1.5°C threshold around 2040. All estimates suggest an urgent need to accelerate locallevel adaptation responses. *Donwload the full text from the right-hand column. Each of these steps is described in detail in the full text. Read more about ASSAR's work on the impacts of 1.5°C global warming here. Nkemelang, T., Bouwer, R., Hoffman, T. and New, M. (2018) Determining what global warming of 1.5°C and higher means for the semi-arid regions of Botswana, Namibia, Ghana, Mali, Kenya and Ethiopia: A description of ASSAR’s methods of analysis. ASSAR Working Paper. University of Cape Town: South Africa.